Blending two or three gases in homogeneous infinitely variable concentrations directly at the end use point, this model G gas proportioner is unsurpassed in convenience and economy. Gas proportioners pay for themselves since they eliminate the need for expensive custom blended gas mixtures. They lend flexibility and economy to the utilization of component gas cylinders and “piped-in” supply lines. Another advantage in laboratory investigations is the freedom to reproducibility increase or decrease concentrations during the course of an experiment. The flowrates are not affected by downstream pressure variations as long as back pressures do not approach or exceed the input pressure. Input pressures of up to 200 psig (13.8 bars) can be used; however, customers very often find 50 psig (3.45 bars) a convenient setting to work with. 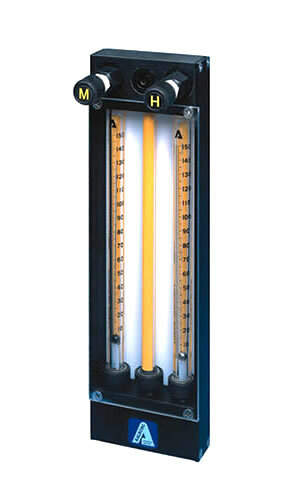 REPEATABILITY ±0.25% FS Typical calibration curves for air at 50 psig/3.5 bars using glass floats are available. Consult with Aalborg on the availability of calibration data for non-hazardous gases and special individual calibrations.